We Love You! And Happy Anniversary! This Thursday, February 15, marks the one year anniversary of the launch of Backyard Worlds: Planet 9. What a year it has been! Let me attempt to sum up where we are, scientifically. It’s hard not to stop and gasp in awe at all you’ve accomplished. For starters, you have performed 4.775 million classifications of images from NASA’s WISE telescope. (The backyardworlds.org site only shows classification numbers for the current batch of subjects–you have done about 322,000 classifications of those.) You have also submitted more than 20,000 objects on the Think-You’ve-Got-One form. All this hard work has yielded 432 objects of interest for our follow up campaign, mostly newly discovered brown dwarf candidates. Because of these objects–and your interest in this work–seem so promising, this fall we were awarded a grant from NASA ‘s Astrophysics Data Analysis Program that will keep us working on the project with you into the year 2020. In two weeks, we’re headed to NASA’s Infrared Telescope Facility to follow up more brown dwarf candidates. Soon afterward, we were awarded five nights of telescope time on NASA’s Infrared Telescope Facility, Apache Point Observatory, and the Blanco 4-meter. That should be enough to follow up about 100 of your discoveries. We have only had a chance to use one of these nights so far–and it was cloudy! Yet, thanks to donations of observing time from other projects, we have managed to collect spectra for 20 brown dwarf candidates (Thank you, Jonathan Gagne and Katelyn Allers!). These spectra show that we have discovered 17 new brown dwarfs. Their spectral types and distances, in units of parsecs (pc) are all listed at the bottom of this post. Only three of the objects we have followed up so far turned out not to be brown dwarfs. Two of these objects (first reported by Sam Goodman, Dan Caselden, and Guillaume Colin) are newly discovered cool subdwarfs, a rare class of metal-poor stars. The one other is an unknown object that’s not really moving, though it might be time variable. So I’d say our batting average is 95% (I supposed that would be .950 if it were an actual batting average).Congratulations to the citizen scientists who spotted these 17 brown dwarfs! They are: Dan Caselden, Rosa Castro, Guillaume Colin, Sam Deen, Sam Goodman, Bob Fletcher, Les Hamlet, Jörg Schümann, Khasan Mokaev, and Tamara Stajic. As you can see from the list, we’re getting close to our dream of finding Y dwarfs. The newest batch of follow-up spectra contained a T9, our coldest brown dwarf find yet, just one subclass warmer than Y0. And we have 38 Y dwarf candidates that we have yet to get spectra of! These take some extra work to follow-up because they are so faint, but we will be working our way down that list over the next year. Note that there are only about 25 known Y dwarfs so far, found by other surveys. So even if only half of our candidates pan out, we will have made a big difference to the field. We haven’t yet found any brown dwarfs closer than Proxima Centauri (1.3) parsecs or Luhman 16 (2.0 parsecs). But they might well be out there, waiting for us. Three of our brown dwarf discoveries are closer than 20 parsecs, so they will have an impact on statistical studies of brown dwarf populations. Our list of candidates contains 25 more that are closer than 20 parsecs, including five closer than 15 parsecs. We may have already found some young moving group members–brown dwarfs that are young, with relatively well-constrained ages, that could potentially be rogue planets. We have taken spectra now of two objects that seemed likely to be moving group members. No luck yet, but one object was a very near miss. Our initial estimates showed a > 90% probability for membership in the AB Doradus moving group. Then, when Jonathan Gagne observed it with the FIRE spectrograph on Magellan, he saw a spectrum that closely resembles that of GU Psc b, a planetary-mass T dwarf in that AB Doradus. So the next night, Jonathan took an might higher resolution spectrum of this object to measure its radial velocity, i.e., how fast it is moving in the direction along our line of sight. Alas, it turned out that the radial velocity was is not consistent with the AB Doradus moving group. But among our candidates are 20 more possible moving group members we haven’t yet been able to check. Most stars in the galaxy come in multiple systems–and brown dwarfs often have companions as well. So we’ve been searching the literature, with help from our citizen scientists, to check for companions to our brown dwarf candidates. We spotted five such likely pairs so far (though one of the companions orbits around a candidate subdwarf, not a brown dwarf). Finding a companion like this around a brown often allows you to constrain the brown dwarf’s age and mass. So we’ve prioritized these for our follow-up campaign. Congratulations to Tadeáš Cernohous, Jörg Schümann and Andy Fischer for finding the comovers. When a brown dwarf has a near infrared “color” that is unusual for its type, it can inform us. Brown dwarfs that are redder than average are often younger; blue brown dwarfs may be metal poor. About 19 of our brown dwarf candidates have stood out to us as having unusual colors. Plus, the spectra we have taken turned up two unusually red objects, and three more that seem notably blue. Artist’s concept of Planet Nine. Planet Nine has so far remained elusive, as have Planet X and Tyche (we are sensitive to gas giants out to about 50,000 astronomical units from the Sun). But we’ve acquired some useful search experience that we’re going to put to use when we reboot the site this spring (see below). Also…nobody else has found any new planets beyond Neptune yet either. So what’s next? Well, we think there are probably roughly 800 more brown dwarfs to find in the data that’s online so far. And clearly our follow-up campaign is just beginning. But that’s not all. As we’ve mentioned, WISE has continued to take new data since the project launched, and already 2 more years of images have been recorded, beyond what’s online at backyardworlds.org! We’re working on adding those to the flipbooks, to help you disentangle dipoles from stars and movers from cosmic rays. They should make our search for new planets in the solar system much easier too, allowing us to process the data in a way that avoids the mess of different hopping and jumping patterns. In the meantime, we’re working on more telescope proposals to follow-up the objects you discovered already. So keep searching, and stay tuned for a reboot of the whole site in the next few months! And thank you for a thrilling, inspiring first year. This table lists our brown dwarf discoveries so far. Author marckuchner2014Posted on February 14, 2018 March 30, 2018 Categories Results and DiscoveriesLeave a comment on We Love You! And Happy Anniversary! It is now winter here in the northern hemisphere, and we’re expecting snow on Friday in Washington, DC. But fear of snow doesn’t stop us from going observing…and observing we have been! Jonathan Gagne returned from his last trip to the telescope with spectra of nine of our brown dwarf candidates—and seven of them are now bonafide brown dwarfs. That brings the total number of brown dwarfs discovered by the project to eight, when you add in our first confirmed brown dwarf from earlier this year. Thanks to Ellie and Eileen for helping with the observations, which they performed using the Folded-port InfraRed Echellette spectrometer prism on the Magellan telescope! And a big congratulations to Sam Goodman, Les Hamlet, Guillaume Colin and Dan Caselden for submitting these candidates that are now confirmed! The spectral types of the new brown dwarfs are: T0,T2.8, T5, T6, T6.5, and two T8s. (WISEA 1101+5400, which we discovered earlier, is a T5.5). Curious how we tell the spectral type from the spectrum? We make plots like this one, below. The black curve is one of the new spectra from Magellan, and the colored lines are other brown dwarfs with known spectral types, ranging from T4 to T8. Which one do you think matches best? Yes, it’s a T8, and it’s currently the coolest brown dwarf we have found with Backyard Worlds: Planet 9, with a temperature of around 750 Kelvin (about 890 degrees Farenheit). The other two objects turned out to be cool subdwarfs, a kind of star that is poor in iron and other metals, suggesting it formed before the most recent generations of stars enriched the galaxy with these metals. Those are poorly understood and interesting in their own right. This new batch of confirmed brown dwarfs contained a few surprises for use. Three of them are strangely bright in the K band; we’re not sure how to interpret that yet. Also, one of the brown dwarfs initially seemed like it might be a member of the AB Doradus moving group, based on its proper motion. Its spectrum looks very similar to that of GU Psc b, a planetary-mass T dwarf in that AB moving group. But Jonathan took a higher resolution spectrum of it, and the new spectrum showed that our brown dwarf wasn’t in the moving group after all. Close call! This new batch is still just the beginning for our follow-up program. First, we have half a night on the TripleSpec instrument on the ARC 3.5 meter at the Apache Point Observatory on January 6, thanks to a proposal led by Katelyn Allers. 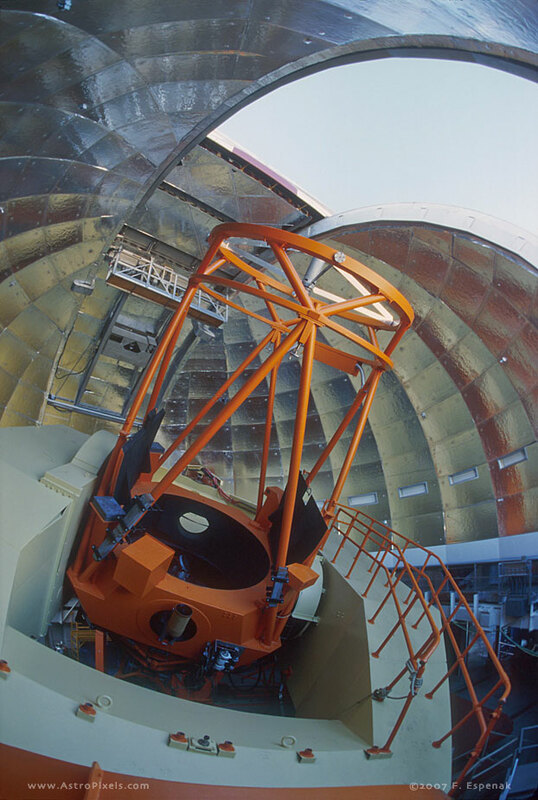 Then, we have two nights using the ARCoIRIS spectrograph on the Victor Blanco 4 meter telescope coming up on March 1+2 thanks to a proposal by Jackie Faherty. By the way, our sister citizen science project, Disk Detective, also won observing time on ARCoIRIS, for April 1+2 to follow up debris disk candidates, so we might do some trading between the two projects. And we have two more proposals for observing time still pending—and a list of now 337 brown dwarf candidates to follow up this winter and beyond. The paper announces the discovery of our first brown dwarf, shows a spectrum we took of the brown dwarf, and describes the Backyard Worlds: Planet 9 project. There’s a press release from the American Museum of Natural History, a nice NPR story about it featuring Rosa Castro, and several other news stories. Of course, this paper is already out-of-date. In the time it took to write the paper, you’ve discovered at least twelve more good brown dwarf candidates. And we used those discoveries to make an even better estimate of the sensitivity of our search than the one that appears in the paper. But let’s talk more about the paper and our first discovery, a source called WISEA 1101+5400 which we now know is a real brown dwarf, spectral type T5.5. Here is WISEA 1101+5400’s flipbook. You may recall that shortly after launch, we were all excited about a faint dipole/mover, which Bob Fletcher had flagged on talk and Tamara Stajic reported on the Think-You’ve-Got-One form. That’s WISEA 1101+5400. A few weeks later, science team member Jackie Faherty nabbed a spectrum of it using NASA’s Infrared Telescope Facility. Here’s a nice plot of the spectrum, created by science team member Joe Filippazzo comparing the our object’s spectrum (black) to the spectrum of another T5.5 brown dwarf (red). It’s a great match! The extra wiggles in our spectrum are simply noise. The quality of the match demonstrates that WISEA 1101+5400 is indeed a brown dwarf, and tells us that its temperature is in the range 900-1500 Kelvin (1200 – 2200 degrees Fahrenheit). We can tell the temperature range by looking at what molecules show up in the spectrum. The spectrum shows features associated with water, methane, iron hydride, potassium, and molecular hydrogen, labelled above. If the brown dwarf were hotter or cooler, the relative sizes of the dips in the spectrum from each molecule would be different. Knowing the brown dwarf’s spectral type also teaches us roughly how bright it is, intrinsically. And since we know that the brightness of an astronomical object falls off as the inverse distance to it, squared, we can compare our images of WISEA 1101+5400 to those of other brown dwarfs to estimate its distance: roughly 34 parsecs or about 111 light years. For comparison, the closest known brown dwarf is the binary Luhman 16AB at 6.59 light years. So what does this discovery mean for our understanding of brown dwarfs? Well, there are already a few hundred T dwarfs known–and this new one turns out to be somewhat run-of-the mill. It’s not super cool, and it’s not in a moving group, for example. Its infrared colors are close to the average colors for brown dwarfs with this spectral type. So we haven’t shattered any paradigms or broken any records with this object just yet. But the discovery is a dramatic proof-of-concept. Just the fact that we found it, only six days after launch, shows that we’re on the right track toward lots more discoveries. Also, Zooniverse founder Chris Lintott tells me that our paper now holds the record for fastest publication from a Zooniverse project. How cool is that? This is a moment to celebrate. Congratulations to us!! Let’s make some more discoveries and write some more papers together. We’re up to twelve brown dwarf candidates now, plus one real verified brown dwarf! Hey everyone! It’s proposal season here at NASA. Every spring, NASA offers astronomers opportunities to apply for grant funding to do their research, and we’ve been busy taking advantage of that, writing proposals. In the meantime, you’ve been hard at work, discovering stuff. We’re up to twelve brown dwarf candidates now plus one real verified brown dwarf. Holy smoke! We can estimate their spectral types based on their relative flux in the WISE 1 and WISE 2 bands (3.5 and 4.6 microns), and it looks like we have 7 new candidate L dwarfs and five new candidate T dwarfs. We’re going to try to get spectra for as many of these as we can. In the meantime, did I mention we’ve been writing proposals? Well in a proposal, you try to make predictions about what you’re going to be able to learn or discover. You also try to show how your work compares to other work in the field. So we started by taking all thirteen objects and putting them on a plot, showing their proper motions and magnitudes in the WISE 2 (W2) band. Those are the red stars on the plot below, which was made by science team member Jonathan Gagne. Then, as you can see, we plotted lots of other interesting stuff on here. For starters, we did our best to add all the brown dwarfs that were previously known. The little blue dots show every other brown dwarf in this database, which is every brown dwarf we could find in the literature. You can see right away that our discoveries, the red stars, fall towards the bottom of the cloud of blue dots made by the other discoveries. So our discoveries are fainter than average. Next, we plotted some lines indicating the detection limits of some other recent surveys, by Adam Schneider et al and by Davy Kirkpatrick et al. (That’s Adam Schneider from our science team.) Those are the two biggest brown dwarfs searches made using WISE before we began ours. The survey done by Schneider et al. only detected brown dwarfs that fall above the orange dashed line. The survey done by Kirkpatrick et al only detected brown dwarfs that fall above the black dash-dot line. Those lines slant upward to the right because the WISE images they used were not divided into as fine time slices as ours, so some faster moving objects got blurred out. Finally, we added some green lines showing what we think are the limits of Backyard Worlds: Planet 9. Now this part is harder since our survey, of course, isn’t complete yet. But we do know more or less what the shapes of the curves should be. We know that they slant up on the left side of the plot because that’s where the motion is too slow and the images of a moving object start self-subtracting. And we know that the objects we have already detected, the red stars, must lie above the lines. So we draw the curves and shift them around till they hug the bottom of the cluster of red stars—and that’s our best guess at our detection limits. Note that there are two green lines. That’s because WISE spent more time making images at higher latitudes (here the symbol, beta, means latitude), so our survey is a bit more sensitive there. There’s only one brown dwarf candidate that’s up at a high latitude where this effect comes into play, though—it’s the one sitting on the lower green line. So there we have it: a prediction for the sensitivity of our search. We will spot any brown dwarfs that fall above the green lines (pick the right one based on latitude). And we are the first to make an all-sky survey of the region above the green lines and below the orange and black lines. (A few brown dwarfs are already known in this region, but they came from surveys that only covered relatively small portions of the sky). Now, remember that this plot uses logarithmic scales! Each of the big ticks on the x axis is a factor of 10. Each magnitude (the y axis) represents a factor of about 2.512. So that space on the plot could contain lots of brown dwarfs and other interesting objects, especially at high proper motions. Good luck! Author marckuchner2014Posted on May 19, 2017 March 23, 2018 Categories Brown Dwarfs, Results and Discoveries1 Comment on We’re up to twelve brown dwarf candidates now, plus one real verified brown dwarf! More Discoveries: New Candidate L Dwarfs! Good work, everybody! You’ve submitted at least five good newly discovered candidate L dwarfs on the Think-You’ve-Got-One form. Let’s talk about L dwarfs. The L spectral type contains object with temperatures in the range of about 1400-2200 Kelvin. It was first established in 1999 by Kirkpatrick et al.. They chose the letter “L” because it is next to “M” in the alphabet; M was the coolest spectral type in the literature at the time, and “N” was already taken to describe a class of evolved stars. Amazingly, L dwarfs are about twice as common as main sequence stars. They are just harder to spot because they are so much more faint and red. The first L dwarf discovered was GD 165B, found by Becklin & Zuckerman in 1988. Curiously, 165B orbits another special kind of astronomical object: a white dwarf. Nowadays, about 1300 L dwarfs are known. So discovering one new one doesn’t usually merit a paper on its own. But when we collect a batch of 50 or so we will definitely want to announce them with a publication, especially if one or more turn out to be in moving groups of young stars. For example, here’s a recent paper by our own Adam Schneider announcing the discovery of 47 new L dwarfs, including seven that are in young moving groups. Membership in a moving group is important because it establishes the objects age. A good clue that you might have an L dwarf is if it doesn’t appear in the DSS images, only in 2MASS and WISE. That’s because the DSS images were taken in visible wavelengths, and L dwarfs are too cool to shine in visible light, so they only show up in 2MASS and WISE bands, which are infrared. (T and Y dwarfs may not even show up in the 2MASS images). Just remember, the rule of thumb is that if it’s not in SIMBAD, we want to see it on the Think-You-ve-Got-One form. There are still interesting objects to find that are in DSS images. Here’s one of the ones you found. It’s a great test for the eyes! It’s a faint bluish dipole. Can you spot it in this flipbook? If not, scroll down to the answer key at the end of this article. Here’s another one. Remember, each one of these is a real new discovery–not a recovery of an object that was known before! Can you see it there? Here’s a third on to challenge yourself with. Ignore that giant blinking blue ghost in the middle! They are tough to spot. If you need help, here are the answers, below. Congratulations to @Andy_Arg, @karmeliet, @graham_d, @stevnbak, and @NibiruX for their exceptional eyesight And keep up the good work, everybody!! Author marckuchner2014Posted on April 18, 2017 March 23, 2018 Categories Brown Dwarfs, Results and Discoveries3 Comments on More Discoveries: New Candidate L Dwarfs! It’s only 23 days since launch. And you’ve already discovered stuff! We are still working on interpreting your classification clicks, and we probably will be for many months to come. But people have already submitted more than 1100 interesting subjects using the Think-You’ve-Got-One form, which is a bit easier for us on the science team to use right away. Among these objects, science team member Adam Schneider quickly spotted at least three interesting ones that we’ll want to include in an upcoming paper. Let me tell you about them. This one has got the science team all abuzz. It’s either a fast dipole or a slow mover. It mover about 1.25 pixels between the first and last epochs. And it’s faint. Faint is good! That means it’s less likely to already have been discovered. It’s a little red (maybe pink) in color, meaning it’s significantly brighter in the WISE 2 band than in the WISE 1 band. In fact, if you look at how bright it is in the WISE 1 and WISE 2 bands, and the fact that it doesn’t appear in the 2MASS catalog at all, you would infer that it is likely to be a kind of brown dwarf called a “T dwarf”. If it is a T dwarf, it is about 30 parsecs (98 light years) away. PLEASE FIND MORE OF THESE!! We are trying right now to find someone who is at the right telescope at the right time to take a spectrum of it, which would confirm that it really is a T dwarf. A colleague offered to observe it for us this week using NASA’s Infrared Telescope Facility. Alas, the weather was bad, and they didn’t even open the observatory dome. There are some opportunities coming up for us to get a spectrum from other telescopes in Hawaii. We will keep you posted. The next two new discoveries appear to be nearby M dwarfs, based on their WISE and 2MASS colors. Nearby M dwarfs like these should make good targets for future exoplanet searches with the Transiting Exoplanet Survey Satellite (TESS) and near infrared spectrographs like SPIREou, iLocator, and the Habitable Zone Planet Finder. Take a peek at this subject. At R.A. 11.8858634 degrees, declination -34.5458256 degrees (halfway up, near the left edge) is a blue-white dipole that appears to be a previously undiscovered M dwarf. This flipbook is a bit tricky, since if you only looked at frame 1, for example, you might think it were covered with dipoles! But when you play the animation, it becomes clear that most of those sources are ordinary artifacts. Thanks to @raychieng for submitting it. Finally, check out this subject. Near the top, slightly left of center, at R.A. 217.8208564 degrees, declination 86.2991835 degrees (it’s almost at the north pole), is a moderately bright white dipole, which also appears to be a previously unreported M dwarf. A VizieR search turns up a high-proper motion source at those coordinates in the PPMXL catalog and the URAT1 catalog, but without a spectral type. However, the photometry (i.e. how bright the star is, in magnitudes) across the suggests that this star is probably an M dwarf. Thanks to @stevnbak for submitting it. How can you tell the spectral type of an object from its photometry? How can you recognize if your dipole/mover is an earth shattering new Y dwarf, a dazzling new T dwarf, a cool new M dwarf, or just a boring old early-type star? Stay tuned–we’ll talk about that in the next blog post. Great work, everybody! These discoveries are the proof of concept that we were hoping for. And I’m sure there will be more to come.